"The Shuck" (Christophers Riverside Cabins) is a family owned home/cabin nestled on the beautiful Shenandoah River in Luray, Va. The cabin has over 1400 square feet of living space. Cabin has all hardwood floors, with tile in the bathrooms. 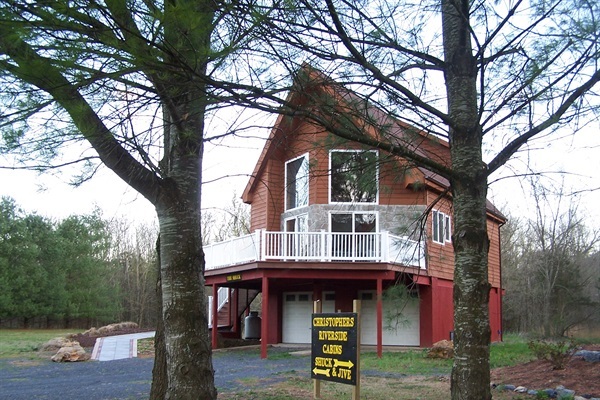 Along with river frontage, our cabin has mountain views and a large private lot and yard. Our cabin is secluded in the country yet still close to the wonderful quaint town of Luray. The property has 2 full baths with tub,showers and a jetted jacuzzi tub in the upstairs loft bedroom. It has a full size washer and dryer, also a dishwasher. Most furnishings in the house are new. At this time, linens are provided for the 3 queen beds however guests must bring their own towels.There's a gas fireplace inside and a large fire pit and area outside for those night campfires and star gazing. There's also a charcoal grill for your use. Enjoy sitting on the deck taking in the sun and sounds of wildlife and canoeing on the river. A canoe is provided. (there are 2 adult one child life vest provided) A private graveled path leads through the yard to the river where you can fish, swim, tube or just relax and take in the scenery. Wildlife abounds in the area. Many deer and turkey frequent the area as well as all kinds of songbirds. You may even get to see the eagles that nest nearby! Our famous Luray Caverns is just 10 minutes away as is its golf course. Locally there are shopping centers which contain a Walmart, Food Lion and a Smart Shopper for your grocery needs. There are many antique stores and shops in town to browse through. Only 13.7 miles from the property is our wonderful Shenandoah National Park where you can enjoy a leisurely drive across the park stopping along the overlooks and looking upon our beautiful Shenandoah Valley! You can see the Skyline Drive from the property in fact. Hiking, picnicking, trail rides and beautiful views and activities for adults and children alike. This riverfront cabin with all its amenities and charm will be sure to fit your needs for getting away from it all and de stressing. Smoking is not permitted in the cabin but is allowed on deck and on property. Remember, we are in the country..the road to the cabin is gravel and there are insects out and about in the warm months..In the winter months we do get snow and ice so keep that in mind if booking during the winter months .We love our cabin on the river and hope you will enjoy it as much as we have. We look forward to you being our guests. Rates are subject to change without notice. Nightly rates below exclude taxes, additional options and fees. Quotes using the book screen include taxes. Enjoy fishing, swimming, canoeing ( canoe provided with 2 adult and 1 child life vest.) or relaxing on our riverfront property. There are several businesses locally that offer shenandoah river canoe/tubing activities in groups as well. A firepit is at the cabin as well as a charcoal grill. Downtown Luray is only a few minutes from the cabin with a Walmart, Food Lion, Smart Shopper for your grocery needs. Also on weekends there are local farmer markets with fresh produce. Luray Caverns golf course is also minutes away. Enjoy our world famous Luray Caverns with its many museums and maze located in our hometown. There are live bands in town on the weekends also. Our town has many antique stores to browse through. Enjoy a scenic drive on the beautiful (Shenandoah National Park) Skyline Drive, with hiking and horseriding as well.